There is no doubt that He supplies all our need and there is not one area of our existence that is not covered by these wonderful characteristics of God. Last time we looked at Jehovah M’Kaddesh, the Lord Who sanctifies. We saw how God had to remove His presence from His people because of their disobedience and sin. I thank our Father God that we as believers in His Son Jesus, are forgiven our sin through Him, and that He is there with us and in us by the power of His Holy Spirit. We were reminded that we are on a pilgrimage, a walk of sanctification, that one day will bring us into the very presence of God. In this teaching we will see how our God is with us, leading us and guiding us as our Shepherd. So let us begin by looking at sheep. Whatever kind of sheep they are, wherever they come from, I think you’ll agree that they are rather silly creatures. They all run in the same direction; once one goes, the others follow, you will rarely see a single sheep going against the flow. Everyone else is doing it so it must be right. They like as a group to be left alone to graze and ruminate, they rarely rush at anything, unless that is, they are pushed to it and then they show how fast they can move. They are easily frightened and can even die of shock. They like to be together in a flock, all moaning and complaining in unison. Baah- meh! Baah-meh! When one gets into trouble, the others just walk off and leave it to its fate. Tough luck chum! They are plagued by pests which get into their skin and cause pain and inflammation. They have foot problems and ear problems and eye problems. Pretty sickly really! They need doctoring and dipping to rid them of their pests. They have to be sheared once a year to keep them cool in Summer and because wool is useful to us. They need water, they need grass. Funnily enough, when they are sheared or treated and are turned on their backs, they go quiet and passive and give up resisting and struggling at being held down.Funny animals, sheep! They are the only domestic animals that cannot survive on their own. They are totally dependent on their shepherd for protection, water, food and shelter. Sheep won’t last long without a shepherd. I think that we can agree that looking after sheep is difficult. In this country we are all familiar with white, or dirty grey, woolly sheep. We see shepherds on quad bikes, driving their flocks before them or walking behind them with a sheep dog or two herding them back into line at the shepherd’s bidding. We see the cute little lambs in Spring, gambolling about, having fun, all playing in green, rolling meadows beside a gently flowing stream. I think of West Dean Gardens in West Sussex and all the sheep you can see there grazing on the other side of the river. A pretty sight, a pastoral view, and we have those lovely peaceful scenes in our minds. In Israel however, things are quite different, both for the shepherd and for the sheep. The sheep there look different. They are generally brown and black as well as a creamy colour, and they have horns, big horns, which can be used to make shofars, the Jewish trumpet. They are a much tougher type of sheep physically, though still prone to the the same sort of problems, infections and illnesses as sheep here. In Israel the shepherd leads his sheep and the sheep follow him. They know their master and follow his lead, because silly as they are, they know he will take them to a place where they can eat and drink. The terrain in Israel is very different too and that is important for us to understand as we continue this study. I am sure that when you knew the subject for this study that you immediately thought of Psalm 23, probably the most well known of all the psalms . It was written by David as we all know, and it describes the qualities of a good shepherd, comparing him with our God, Jehovah Rohi….The Lord Our Shepherd. David was a shepherd long before he was a king. He knew all there was to know about sheep and I believe that he could clearly see, as can we, how like sheep we all are. Eat, drink, I need food, take me to it! Leave me be, don’t rush me! Love to be with the crowd! Everybody else is doing it, so it can’t be wrong! I’m too hot, I’m too cold! I’m sick, I need a doctor! I’m scared, I’m on my own! We need the shepherd! Oh, how we need Him! Yes, David knew sheep. He knew the land too. He killed a lion, he killed a bear to protect his flock. It was tough country, not at all like the pleasant green fields of England. Bethlehem was David’s home which is not far from Jerusalem. Indeed the flocks of sheep were in that area to provide for the sacrifices required in the Tabernacle and later the Temple. So shepherds were looked down upon, but God did not look down on them, He blessed them. He blessed David. David was a shepherd. Imagine God choosing a despised shepherd to be the King over His people Israel. He blessed the Temple shepherds. He blessed the family of Jacob. Shepherds are actually very skilful people. There is nothing about sheep that they do not know, they are highly trained professionals. They recognise their sheep individually, and they know the land that they walk. The land around Bethlehem that David was so familiar with is located on the central mountainous spine of Israel on the edge of the Judean wilderness. It is dry and barren, with scrubby plants, rocky and dangerous with many gorges and deep wadis that flow with torrents of water in the rainy seasons and are bone dry the rest of the time. There seems to be nothing for sheep to feed on at all. The truth is that for those, like the Bedouins today, who are trained to find it and recognise it, the wilderness is filled with water sources and plant life sufficient to sustain large flocks of sheep and goats. Indeed if you visit the area today you will see these flocks shepherded by Bedouins. David would certainly have possessed such knowledge in his day. Please don’t imagine him sitting on a grassy knoll overlooking his quietly feeding flock by a gentle stream. Such a picture is a fairy tale.i Chris and Lindy Hill take tour groups to Israel and indeed have been over 89 times to date. This is what he says in his little booklet called ‘The Song of the Shepherd’ (for which I am grateful for a lot of information) . ‘When Lindy and I take our tour groups to the Holy Land, we are sure to include the Wadi Quelt. The dry riverbed winds through towering cliffs in the Judean Wilderness between Jerusalem and Jericho. Part of it is so deeply carved into the earth thatnit never sees the sun. For as long as anyone can recall it has been known locally as the ‘Valley of the Shadow’. No! Being a shepherd in that part of the world is not an easy job.sheep fall into ravines or wander into dangerous caves, they get caught up in thorny bushes, they get lost, they get taken by wild animals. I think that once we understand just how difficult it is to be a shepherd out there in that inhospitable land, then we get a far more balanced idea of the meaning of Jehovah Rohi….The Lord our Shepherd. The term ‘shepherd’ appears more than 80 times in the Bible and in the Hebrew covers meanings such as, feeder, keeper, companion, friend, pastor, herdsman as well as of course shepherd. There are a number of shepherds mentioned in the Old Testament, from Abel onwards, and the figure of the shepherd became an illustration of the relationship between a leader and his people. In Exodus 3 v 1 Moses, who was tending sheep when he saw the burning bush and was appointed by God as the shepherd of His people Israel and of course David who was a shepherd of the sheep and became the shepherd of the people of God. (2 Samuel 5 v 2). 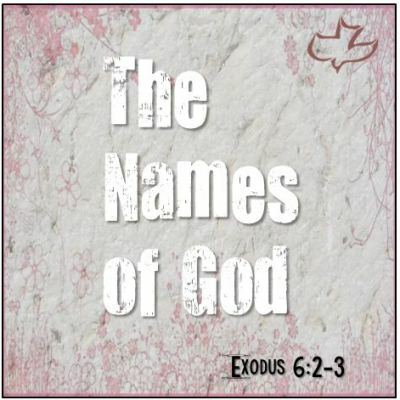 But the ultimate expression of this name of God is of course Jehovah Rohi….the Lord our Shepherd. Psalm 23 speaks to us deeply of the love of God for His people, for us. Davis knew the needs of his sheep and could identify himself with those sheep. He saw the similar tendencies between sheep and people. He knew that he needed a shepherd. It is believed that this psalm was written towards the end of David’s life after he could see how foolish men could be and indeed, how foolish he had often been, just like sheep. He knew that a shepherd provided for his sheep and he knew that God had provided for him in the same way. As I was preparing this, I pondered on this Psalm and this is what I wrote. My Shepherd gives me everything I need, I want for nothing. I am content and totally dependent on Him. He MAKES me – a bit like the sheep who are forcefully turned on their backs to be sheared and accept it passively after a struggle with the shepherd. He knows what is best for me and sometimes has to make me see His point of view, despite how I fight and struggle to get my own way. He knows where the best pastures are and He knows that I need to accept His provision and not try to find my own way in my own strength. Sheep’s nostrils are close to their mouths and is they try to drink from a rushing stream they are likely to drown. They need a placid pool to drink from, like the pools of water in the Wadi Quelt. He wants me to quench my thirst in Him and not drown in the world full of torrents of depravity. Quenching my thirst in Him means that I will be restored and refreshed in my mind by His word and by His presence. He knows the paths He has prepared for me and He wants me to walk those paths, so He leads me because if I say I am a believer and live a lie then I am damaging His Name. He wants me to be righteous, even though, like those sheep in the wilderness, the way is rocky, rough and difficult, steep, dangerous and precipitous. If I trust Him completely then He will guide me through the dangers awaiting me on the right path, the narrow path. The Wadi Quelt is dark and dangerous and so sometimes is my life. It’s scary and God seems so far away and the enemy seems so close like a lion prowling around seeking to devour me. But my Shepherd is there despite how I feel. He is protecting me with His rod to beat off the enemy and His staff to keep me on the right track. What a comfort to know that He is with me in times of darkness and trouble as well as in the good times. He leads me into this dark place for a reason. To take me somewhere better, to help me to trust Him more than I did before. He is my sustenance in all situations, and I can hold up my head before those who would seek to harm me and know that they can do nothing to keep me from Him and His provision for all my needs. He fills me with His Holy Spirit to overflowing, like oil poured over my head, like a cup filled up and brimming over. He heals, He protects, He blesses me, He gives me strength, surely I need no more. He is so good to me! I need never be without Him, I need never be lost for He is always my Shepherd and He will always lead me and guide me and be there for me, whatever happens. My life is filled with His goodness and His mercy even when it doesn’t feel like it. I will dwell in the house of the Lord forever; And one day I will go home to be with Him for all eternity, part of His Bride, the true church, to,praise and worship Him and thank Him forever. He knows each one of us by name. John 10 v 3. We bear His mark just as sheep are marked by their shepherd to identify their owner. We are His. He is our example and we follow Him and obey His will. (Hebrews 13 v 20-21). Do you remember how How Jesus spoke to Simon Peter after His resurrection? Peter was ashamed and guilty that he had betrayed Jesus so easily, and was all for going back to his trade of fishing; his old nature was kicking in again. Jesus was so loving in the way He spoke to Peter, Jesus knew his heart, He could see the struggle going on there. (John 21. v 15). Peter was grieved that he could not rise to Jesus request to love Him as Jesus loved Peter (agapeo), all he could promise Jesus was that he loved Him as a friend (phileo). So Jesus came down to Peter’s level and agreed to love him back as a friend for the time being. You see Jesus knew what Peter would become after he was filled with the Holy Spirit. Peter would be filled with that consuming, compassionate love for Jesus, so much so that he would give up his life for Him. Peter would indeed take care of the sheep and he would become a faithful shepherd of the sheep. Once he allowed the Good Shepherd to lead and guide him he was able to lay down his wilful and wayward old self and devote himself entirely to Jesus. I love what Jesus said to Peter, ‘Follow Me!’ The very words He used to call Peter to Himself three years before. A new start, a new beginning. It’s never too late to change our ways and follow the Great Shepherd of the Sheep. Let us keep our eyes fixed on Him so that we can honestly say Jehovah Rohi……the Lord is my Shepherd. May the Lord Himself bless you and keep you in His perfect ways.